In the LIFEPAC American History Set, your child will study the history of the United States of America. Using ten engaging worktexts, children study the New England colonies and the birth of the United States in this Alpha Omega curriculum. Instruction continues through every period of U.S. history culminating with a record of recent events. Want to give your child an in-depth look at the exciting past of American History? Try the LIFEPAC American History homeschool curriculum from Alpha Omega Publications! This colorful, fun history curriculum integrates U.S. history with a biblical perspective. What could be better? 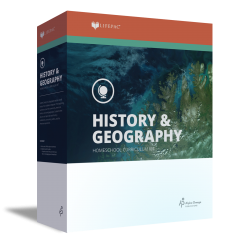 The history strands covered in this curriculum at most grade levels are geography, history, government, citizenship, economics, and social studies. Presenting lessons in ten colorful worktexts, the focus of LIFEPAC American History Set is United States History. Your homeschooling child will study the complete history of our country beginning with the foundations of democracy, the New England colonies, the Revolutionary War, and the birth of a nation. Other topics covered in this Alpha Omega curriculum include the War of 1812, the politics of slavery and the Civil War, industrialism and isolationism, the Great Depression, world wars, and the presidencies of Kennedy, Johnson, Nixon, and Ford. Also take a look at the other features we've included! Student worktexts include daily instruction and review as well as ample opportunity for assessment of student performance using self tests and unit tests. To encourage individualized instruction, we have included a teacher's guide designed to help you guide your student's learning experience according to his specific interests and needs. This essential teaching resource includes teaching notes for each unit, a complete answer key, and information about additional resources and learning activities. So why are you waiting? Order LIFEPAC American History Set for your child today!